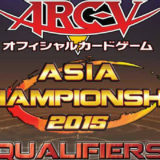 The OCG 2017.10 Limit Regulation had hit Dinosaur, True Draco, Invoked, and even ABC, leaving SPYRAL to dominate the competitive scene. 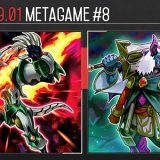 Compiled from a total of 432 top-placing decks from 73 competitive tournaments held in Japan, China and Asia, here is the final metagame breakdown of the OCG 2017.10 format. 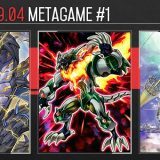 SPYRAL has been the dominant deck to beat from the start and remained so all the way till the end of the OCG 2017.10 format. 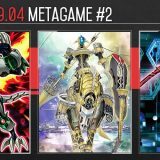 SPYRAL has the best opening, being able to setup Tri-Gate Wizard, Firewall Dragon, SPYRAL GEAR – Utility Wire with either Number 41: Bagooska the Terribly Tired Tapir or SPYRAL Sleeper equipped with SPYRAL GEAR – Last Resort. 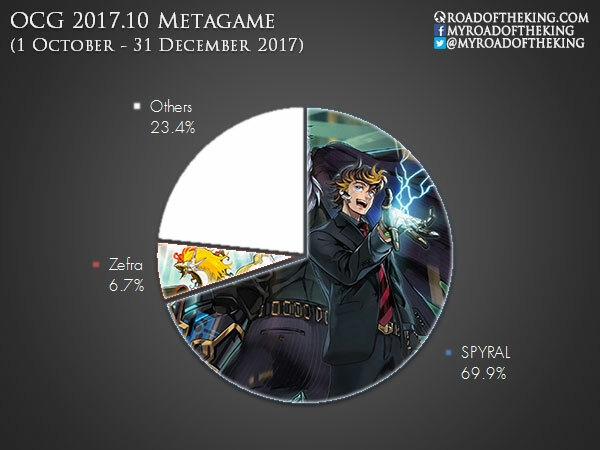 If SPYRAL is able to go off undisrupted, there is little chance of breaking this opening board. Playing 2 Maxx “C”, 3 Ghost Ogre & Snow Rabbit and 3 Ash Blossom & Joyous Spring is insufficient against SPYRAL and they are often supplemented with another set of Ghost Reaper & Winter Cherries, Droll & Lock Bird or Effect Veiler. 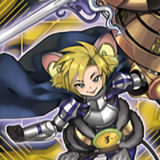 The release of Security Dragon in late October gave rise to the Grinder Golem variant of SPYRAL. Although Grinder Golem is more risky against disruption, it has a much higher reward too in being able to Link Summon Saryuja Skull Dread using 4 materials frequently. 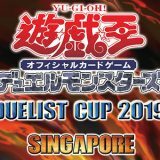 The OCG 2018.01 Limit Regulation has heavily crippled SPYRAL, but surprisingly it is not quite dead yet. The deck has reverted to its initial build – using Foolish Burial Goods with the SPYRAL MISSION cards. 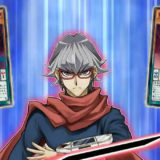 However, SPYRAL would likely remain as just a rogue deck since there is no further support for them in the foreseeable future sets. 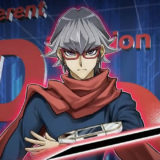 Zefra rose to popularity as an anti-SPYRAL deck. 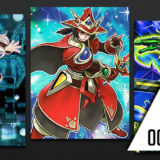 Zefra relies on using Zefraniu, Secret of the Yang Zing and Zefraxi, Treasure of the Yang Zing to Synchro Summon Chaofeng, Phantom of the Yang Zing. 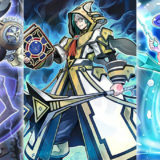 Since Chaofeng was Synchro Summoned using EARTH Attribute Yang Zing monsters, it would prevent the opponent from activating the effects of EARTH monsters. 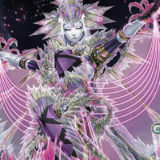 Many SPYRAL monsters such as SPYRAL Quik-Fix, SPYRAL Super Agent and SPYRAL Double Helix are EARTH attribute and would be rendered null under the effect of Chaofeng. 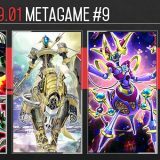 The release of Heavymetalfoes Electrumite and Crystron Needlefiber in LINK VRAINS Pack enables Zefra set up a double negation with Nine Pillars of the Yang Zing and Zefra Divine Strike, and double removal with T.G. Wonder Magician and Baxia, Brightness of the Yang Zing. 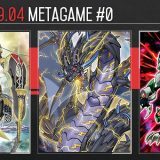 Zefra is unaffected by the OCG 2018.01 Limit Regulation and is currently one of the top competitive decks to beat in the new format. 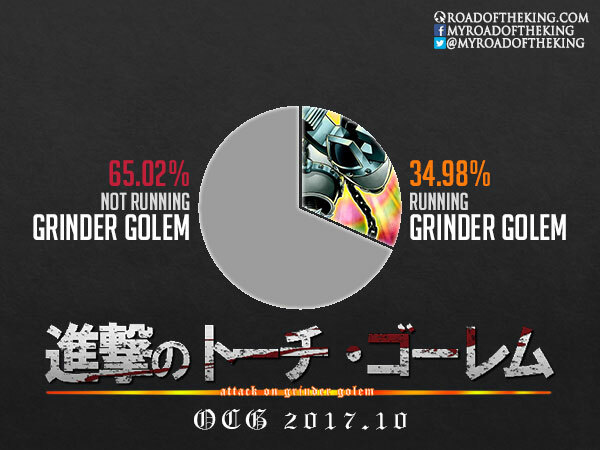 Counting just the decks after the release of Security Dragon on 21 October 2017, out of 316 decks, only 101 were running Grinder Golem. Among them, 93 are Grinder SPYRAL, while 113 are mono SPYRAL. Despite Grinder Golem‘s incredible potential to create up to two Link-4 monsters with just a single Golem, it is vulnerable to disruption from Maxx “C”, Ghost Ogre & Snow Rabbit and Effect Veiler. This makes Grinder Golem a relatively high risk high reward playstyle that some players are not comfortable with. 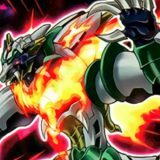 The drawback of being unable to Normal Summon also makes them difficult to be run by most decks – mainly just SPYRAL and Infernoid were able to utilise Grinder Golem effectively. Excuse me what was updated in this post in January 11th? Just fixing some typos or grammatical errors.